Click Download File to access this document. 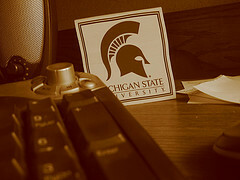 Part of this class was researching the online PMBA (Personal Masters in Business Administration). We studied the document and it's wealth of online and print resources. We had discussions as to whether employers would hire someone who had completed this program over someone who had spent thousands of dollars to "get the piece of paper". The resources are fantastic and you can easily see how many of them could be used in areas other than busniess. We were to choose a resource and evaluate it's place in Educational Technology. We were then asked to create our own Personal Masters in Educational Technology. I included many resources I felt were very important to perform my current job. I have already found that my list continually evolves but better yet, I return to the original document for sources to keep learning.